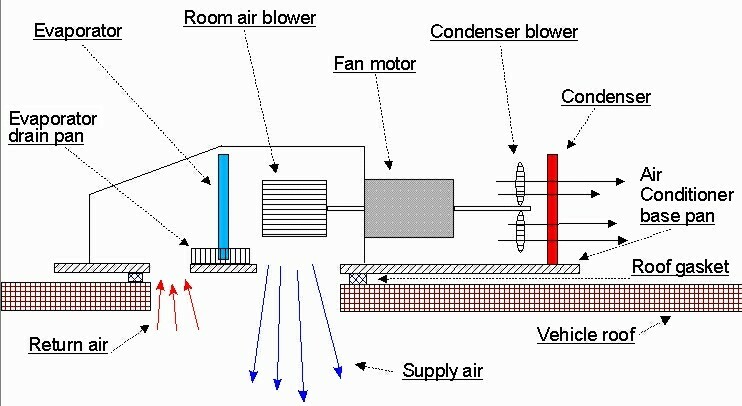 Now that we have seen how an air conditioner does the work, let's look at the mechanics involved. We can see that there are two main systems in a roof top air conditioner, the sealed refrigeration system, and the air handling system. In addition to these systems, there is, of course, the control system (thermostat and fan switches).For the sealed system, all brands, Coleman, DuoTherm, Carrier, Intertherm, and others, work the same, using the basic principals of refrigeration. In the sealed system, the main component is the compressor- which, by itself, is not serviceable, but there are some components that are external to it which are serviceable. For now, let's look at the most common and easily repaired problems. The one major compromise that roof top air conditioners all have in common is the fact that they all have to route both the return and supply air through a standard 14" by 14" cutout in the roof. This is even more amazing when you realize that the average 13,500 btu air conditioner has just over 1 ton of cooling capacity- a 15,000 btu model is around 1 1/4 tons. A motor home or large trailer that has two 15,000 btu air conditioners has 2 1/2 tons of air conditioning- or enough capacity for many houses. The two most common complaints are "Not cooling enough" and leaks. Let's look at "not cooling" first. Not blowing cold air. The first thing to determine is if the compressor is coming on. If it isn't, it is likely a control problem with the thermostat or relay board (if you have a wall mounted thermostat). If the compressor is coming on, then you need to look into the airflow of the unit. Whether or not the compressor is coming on, you need to check the voltage. Like every appliance on board, the air conditioner needs adequate power to operate. If the voltage is 110 volts a.c. or below, the effectiveness of the unit will start to suffer. After verifying correct voltage, we need to look at how the air conditioner does it's job- it requires adequate air flow over both the inside (evaporator) and outside (condenser) coils. If the air filter is clogged refrigerant will not be able to pick up enough heat from the inside air, and if the condenser coils are blocked by leaves, it will not be able to give off enough heat to the outside air. Most RV rooftop air conditioners have washable filters, which can be vacuumed or rinsed off in a sink to clean. If you are in summer weather where the air conditioner is running 24 hours a day, the filters should really be at least vacuumed once a week. Note that if the filters have been neglected, the evaporator coils probably need cleaning as well. These can be seen when you remove the air filters, and possibly the inside air box. Likewise, the condenser coils can be seen after removing the upper shroud. Note that some air conditioners draw air in from the back, and some blow air out the back. You will need to determine which your is, or just check both sides of the condenser. An unavoidable drawback to being able to mount an air conditioner in a 14" by 14" roof vent cut out is that both the supply air and the return air are in very close proximity to each other. This can be a problem if the two are not sealed well from each other- if the cold supply air can recirculate into the return side, the evaporator coil can easily freeze up, plus that is cold air that is just going to waste. Note that this is normally more of a problem with ducted type air conditioners than the standard exposed air box type, but it is something that you need to be aware of, in all cases.A fairly easy way to check is to simply, carefully put your hand into the return air duct and feel for cold air. If you can feel cold air, you need to take care of the air leak. The last problem we will talk about is heat gain. One compromise that most RVs make is in the insulation department- after all, if they had 6" thick walls for good insulation, there wouldn't be much living room left, so.. In very hot weather, and direct sun, the amount of heat that the RV will pick up may be greater than the amount of heat the air conditioner will pump back out. In this case, shade is the answer! Whether you use an awning, or an oak tree, in very hot weather, keeping the direct sun off of the RV will greatly increase your comfort.